The historic market town of Guisborough lies lies at the foot of the Cleveland Hills and on the northern edge of the North York Moors National Park. The town's name derives from the fortified place of a Scandinavian called Gigr. 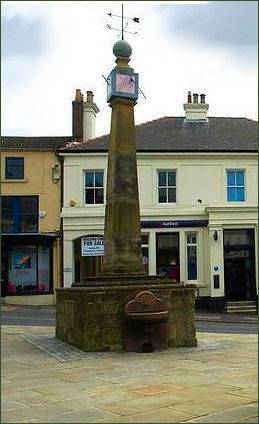 Guisborough is recorded in the Domesday Survey of 1086 as 'Gighesbore' prior to the Norman conquest it was the property of Siward, Earl of Northumbria. The ruins of Gisborough Priory date to the twelfth century. After the Norman Conquest, King William the Conqueror gave vast lands in the area to his maternal half-brother, Robert, Count of Mortain, who passed them to Robert de Brus, Lord of Skelton, one of the largest landowners in the north, who fought on the English side at the Battle of the Standard in 1138. Some theories date the town to the Roman occupation of Britain, when it may have been a military fortification. Discovery of a few Roman artifacts support this argument, such as an elaborate ceremonial helmet, the Guisborough Helmet, but as yet, the theory remains unproven. The Guisborough Helmet, a Roman cavalry helmet, was discovered near the town in 1864. It was originally fitted with protective cheek-pieces, which have not survived; the holes by which they were attached can be seen in front of the helmet's ear guards. It is lavishly decorated with engraved and embossed figures, indicating that it was probably used for displays or cavalry tournaments, though it may have been worn in battle. The helmet was found in a bed of gravel, distant from any known Roman sites. The helmet is now on display at the British Museum. The parish church of Saint Nicholas (pictured above left) houses the de Brus cenotaph (below right), an ornately carved 15 feet long piece of Egglestone marble. One end of the cenotaph is now missing, but an old drawing shows it depicting Robert the Bruce, King of Scots, whose family lived at Skelton Castle. Robert de Brus I came to England from Brix in Normandy in about 1100, and was granted extensive lands here and later around Annandale in the Scottish borders. A monastic patron, he was the founder of Gisborough Priory and his son William de Brus was the first Prior. Another son, Robert II de Brus, inherited the Scottish lands, and the famous Robert the Bruce, King of Scots, who defeated Edward II of England at Bannockburn, is descended from his line. 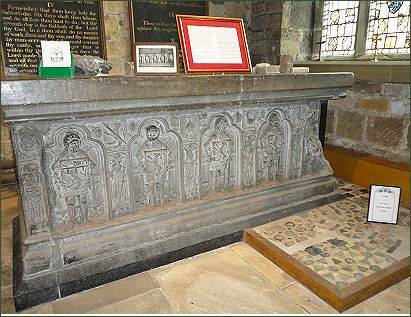 The cenotaph depicts English knights on one side, separated by Saints Jerome, Ambrose, Gregory and Augustine, while the other side has the Scottish knights, separated by Saints Matthew, Mark, Luke and John. The missing West end is reported to have had the picture of a king, probably Robert the Bruce, and the East end has a seated figure, possibly the Virgin Mary, after whom the priory was named, or the enrobed figure of Robert de Brus I, the founder. The other end of the cenotaph turned up at Hardwick Hall, Sedgefield, which also has De Brus connections. 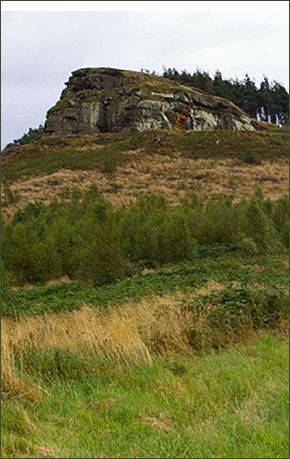 The monument is believed to have been made in 1520 and given to Gisborough Priory by Margaret Tudor, Queen of Scotland and sister of Henry VIII, as a gesture of reconciliation after years of war between England and Scotland. The cenotaph was brought to the church following the Dissolution of the Monasteries in the reign of Henry VIII. A church has occupied the site since 1290, although the chancel dates from the late fifteenth century. Its nave and interior have been altered; the church, in its present form, is the result of a major re-building between 1903 and 1908. An eighteenth century market cross (pictured above right) decorated with sundial and weather vane stands at the top of Westgate, a street typical of the old market towns in the area. A traditional market is held on Tuesdays, Thursdays and Saturdays. Gisborough Hall, a Victorian mansion, was built in the Jacobean style, in 1856. It is the former home of Lord Gisborough. The estate was owned by the Chaloner family from just after the dissolution of Gisborough Priory until the 1940s, it now serves as an hotel. Guisborough Museum occupies the old Stable Block at the rear of Sunnyfield House. 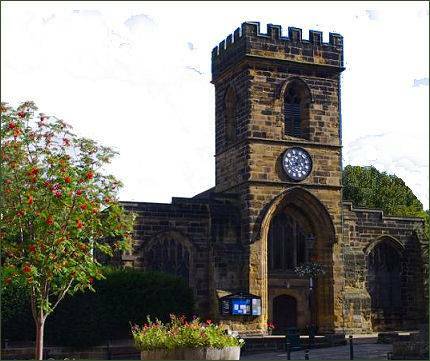 It was established in 1989 to provide a safe haven for the fast-disappearing social heritage of Guisborough. The Museum currently displays over a thousand objects each of which represent some facet of Guisborough's social history. It also houses a very popular Railway Exhibition with its scale model of the old station also includes rare photographs exclusive to the museum. There are also e xhibits from last century’s school days, Victorian toys, exquisite model houses, and records of those involved in World Wars. Displays are changed each year so that different themes can be showcased. Augustinian Gisborough Priory was founded in 1119 as the Priory of St Mary by the Norman magnate Robert de Brus, who was an ancestor of the Scottish king, Robert the Bruce. It became one of the richest monastic foundations in England with grants from the crown and bequests from de Brus, other nobles and gentry. The priory became known for its strict observance of the Augustinian rule and religious precepts. Its reputation for living a canonical life attracted Saint Malachy from Ireland who, as Saint Bernard of Clairvaux had a long and close involvement with the priory. 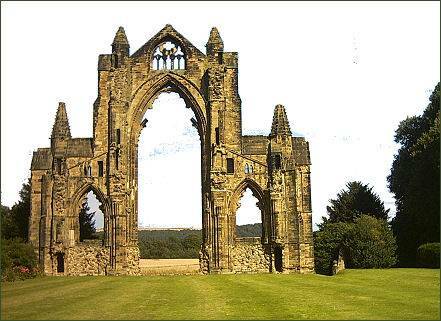 The priory was formally dissolved on 8 April 1540 during the reign of King Henry VIII and was surrendered to the king's men on 22 December 1540, making it one of the last monastic houses in England to be suppressed. The priory buildings, with the exception of the gatehouses and the great east window, were demolished. Demolition was carried out by collapsing its central tower into the body of the church, crushing it in its fall and reducing it to rubble. The ruins are dominated by the dramatic skeleton of the fourteenth century church's east end, which still stands to its full height. Several of the priory church's column bases can still be be seen, the outline of the cloister is visible but is largely unexcavated, while the ruins of the west range constitutes the largest area of other remains above ground. A ruined gatehouse and a still-intact dovecote (below), which is not open to visitors, stand on the western edges of the site. Gisborough Priory is managed by English Heritage in partnership with the Gisborough Priory Project.